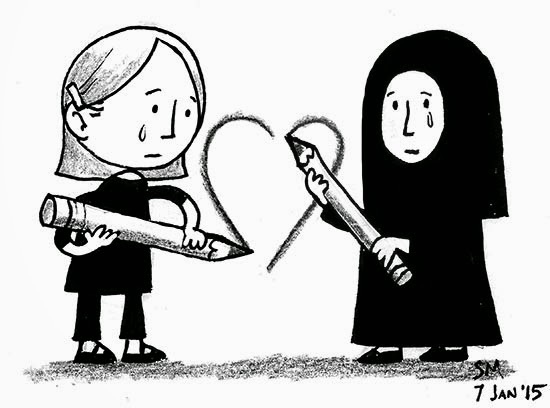 How can we, as children's writers, respond to the horrific massacre in Paris yesterday? As I watched people gather in Paris and London, holding pens in the air as a protest against those who seek to silence, I asked myself how can I use my pen, my ability to write, my privileged position as an author, to oppose and prevent future atrocities? - Oppose extremism in every guise. Stress shared humanity and values. Never glorify violence, warfare or death. - Give children the idea that conflicts can be addressed and even solved through talking. - Feed and encourage their sense of humour. - Support the education of children all over the world. The extremists of ISIS and Boko Harem are waging a war on children, slaughtering them in their schools, because they fear the power of reading, writing, thinking. - Celebrate cartoonists and writers who poke fun at authority. - Write about the real Islam, the moderate peace-loving Muslims, who are horrified by acts of violence carried out in their name and against many of their community. Do not allow the extremists to become the face of Islam. - Champion freedom of speech, even if that freedom leads to offence. This is a difficult one, because there's a natural and correct strong urge to avoid giving offence, and so many words can be exceptionally hurtful. I've just written a book set in Amsterdam, where I lived for many years, and I was often surprised by Dutch bluntness - a by product of a deeply held belief in the freedom of speech, whatever offence that may cause. Je suis Charlie, say the placards in the Place de la Republique and Trafalgar Square; in Berlin, Montreal, New York, all over the world. Je suis Charlie. Nous sommes Charlie. But what are we going to do? This is excellent. I really agree with you that we cannot let the Extremists be the face of Islam - and all your suggestions are spot on. I think you make really good points about free speech. As Anne says - and thank you for such a timely post. "Do not allow the extremists to become the face of Islam." Yes. They aren't. Thanks for getting this up so quickly. Satire is much more powerful than the gun and remains even more so now. Dictators are right to fear it since humour is a principal defence to help maintain the sanity of the oppressed. Freedom of expression is fundamental and all writers and illustrators must fight to maintain and support this right everywhere. There are courageous and sane Muslims. My wife recently played in a band at a wedding between a Muslim and a Jew in Derbyshire, with an Imam and klezmer music. We can all get on together no matter what we believe. Keren, I completely agree that the right to offend is important. I am in complete sympathy with your aims. But I don't think any of the education and persuasion you suggest will work. This violence is perrenial. It's existed since pre-history and it's part of being a community of quite clever talking chimps, who aren't as clever as they think they are. Everything you say is true, but will only work with those already inclined to think your way. There are always those (even in primary school) who will form their identity in opposition to you, simply to be 'Not You.' Because they don't want the same things you do. There will always be those who turn to violence because it seems a quicker and more effective way of getting what they want. They will be impatient with any alternative you offer them. They will think you ridiculous. No, it isn't about Islam - any more than the Crusades and the Inquisition were about Christianity. It's about power, wealth and control: which come to pretty much the same thing. There are those - and there will always be those - who aren't interested in peace, or cooperation or equality. They're interested in power, and in being in control, even if only as a foot-soldier on the winning side. They will not learn your lesson, however you pitch it. They will always try to silence you. All we can do is (as you also say) stand firm, reexamine and confirm our beliefs, and refuse to be intimidated. I salute George RR Martin for volnteering to show 'The Interview' in his own cinema, after Sony and other corporations caved to intimidation from Kim Jong-Un. I stand with you, Keren. There will always be extremists and violence, Susan, but I don't think we should ever lose faith in the idea that it is worth sharing ideas about peaceful co-existence. We have the opportunity to plant seeds of peace in young minds. The vast majority will respond. A wonderful and moving post. I think you've said it all. Those who, for whatever reasons, are attracted to terrorism (or serial murder,) won't be swayed by being taught that it's wrong, or unpeaceful, or uncooperative or unloving. They despise those things. They are attracted to terrorism precisely because it isn't any of those things, which they see as weakness. If this sounds sarky, I don't mean it to. I agree with you. I agree that the values of peace and negotiation should be taught and reinforced. But I also fear that the people you need to reach most are the very people who won't be touched or affected by these lessons in any way. Violence will always be with us. Create a community of peaceful, honest people and you create an ecological niche for dishonest thugs. We have to go down fighting for peace. But Susan, this isn't just about the kids who go on to become terrorists. This is about all of us and how we respond to this event. In particular how we understand that freedom of speech comes with the possibility of offence, and why that is an important liberty. Extraordinary number of people today blaming the victims. I think we can always do something as writers. We can write, we can speak out and we can raise the issues with young people where appropriate. My work in schools in the UK, Germany and Paris - in fact in Montrouge where an attack took place this morning - shows me how keen young people are to discuss all of the political and social issues. The pen is mightier than the sword! And we can all always hope to make some sort of positive difference. I don't think anyone - writers, teachers, sales assistants, roadsweepers, anyone at all - should ever give up on hoping to do that. Good post Keren. Oh, I am entirely, 100% in agreement with you about understanding that you cannot have free speech without offending someone - and the stupidity of blaming the victime. By that logic, if I make a joke about Hitler, and Neo-Nazis shoot me, then it was my fault for thinking badly of mass-murderer Hitler. That kind of thinking takes us into a crazy hall of mirrors. This is an opportunity to show a positive response - love if you like - towards those who are different. It's the only way to fight fear. I was so inspired by the way the Australians responded to their own hostage situation recently, by individuals on social media tweeting 'I'll ride with you' to show solidarity towards ordinary Muslims. Enough to make you want to cry.